Motorcycles are a fun and easy way to drive around Pompano Beach. The weather welcomes motorcyclists riding through Pompano to the beach, restaurants or shops. Reflecting the popularity of motorcycles in Pompano, there are numerous motorcycle dealers in the city, which do a robust business. The drive along the ocean is a favorite motorcycle route, as riders seek to enjoy the scenery and Florida's warm weather. Other motorcycle riders take the I-95 for the morning commute, preferring the lower fuel costs and greater flexibility of motorcycles over cars. Most motorcycle drivers are safe and take numerous precautions on the road. They are aware of their surroundings and understand that motorcycle riders lack the protection provided by the metal frame of a car, if they are in an accident. Both motorcycle drivers and passengers are at risk of serious injury or even death, if they are involved in an accident, and will likely need legal help to recover damages. Motorcycle drivers themselves can put passengers at risk and cause accidents through negligent behavior, such as speeding or abruptly changing lanes. This type of reckless driving also increases the risk of a motorcycle accidents. However, it is often the individual driving a car who is responsible for motorcycle accidents in Pompano Beach. One of the major causes of motorcycle accidents is drivers who fail to see the biker. Cars turn into motorcycles, cut them off, change lanes into them, causing serious wrecks. On the residential roads of Pompano Beach, individuals can abruptly open car doors, without realizing that a motorcycle is approaching, causing a serious accident. Fatal motorcycle accidents are more likely to occur on major highways due to the speed of travel on those roads. 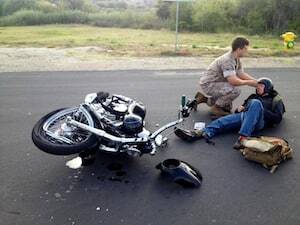 Another cause of motorcycle crashes is faulty equipment. The bike itself may have defective parts, or mechanics may have conducted faulty maintenance on the bike. Any type of malfunctioning equipment can significantly increase the risk of a motorcycle accident. Motorcycle drivers and passengers are more likely to suffer serious injury in an accident, than those in a car because of the lack of protection from the vehicle. In fact, in a motorcycle accident, the bike itself can contribute to injury by falling on a driver or passenger. Injuries from motorcycle accidents can be extremely serious. They can range from abrasions and sprains to spinal cord injuries, complex fractures, brain injury and even death. Even a relatively minor motorcycle accident is likely to require medical care and can result in the loss of wages because of inability to work due to injuries. There is also the possibility of pain and suffering from a motorcycle accident and the long-term medical care. The professional and experienced attorneys at Frankl & Kominsky can help victims of motorcycle accidents recoup losses incurred through no fault of their own. Our attorneys tailor our approach specifically for each case, working to obtain the best possible compensation for our clients. If you are have been injured in a motorcycle accident in Pompano Beach or other South Florida locations, or if you have a loved one who has suffered in a motorcycle crash, call us today for a confidential consultation at (855) 800-8000 or contact us online. We speak Spanish and Creole.